Lost is a popular ABC TV show with a pretty simple plot: a plane crashes on a remote island and the plain survivors get stranded on the island, which (as they soon find out) is modestly said a bit odd with a few shy monsters, polar bears, whispers, the Others and what not. Through the show we try to learn more about the island and the lives of the survivors in a really interesting way. The show itself is quite interesting, but what has really made it stand out was the Lost Experience that kept fans busy during the summer break. The Lost Experience provided fans with new mysteries and some explanations in different forms and through different channels. Fans were hunting for clues through websites, ads, voice mail and even a novel, and had to use various skills to make sense of the clues. The creators of the game also managed to include very clever ways of advertising for different products (see the Wikipedia article). Ok, ok - I’m a Lost fan and all this is of course very interesting to me, but why am I writing about the Lost Experience on this e-learning blog? Well, it is my opinion that educators could learn a thing or two from this interactive game and perhaps use it to our advantage in our classes. Just imagine a class that would be as interesting as the show and that would provide additional information (and training) through a series of interactive web (or mobile) tools. Just imagine your students getting so fanatic about searching for new clues and having to use different skills to access them. That would be pretty cool, right? 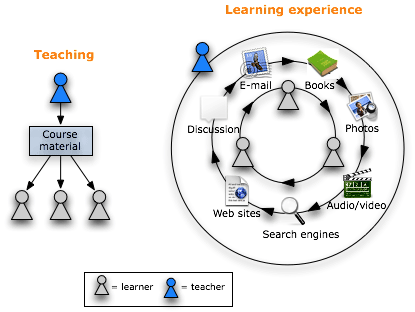 I already wrote about a similar form of learning in my post about WebQuests, and the Lost Experience was a sort of WebQuest, but I think such quests (not just with the web prefix, but also including libraries, mobile technologies, traditional media etc.) should also be taken a step further by lectures (not necessarily exclusively face-to-face) that would interest students in the subject perhaps with a bit of mystery and stories - why shouldn’t we borrow some tricks from the most interesting TV shows? If I think back to my education I see too many boring hours of facts (not always up-to-date), interesting topics killed by poor delivery, too little space for creativity and not enough of collaboration. And collaboration is also something very important that made the Lost Experience not just interesting but also possible. The Lost Experience would be a really boring and difficult experience to follow without the collaboration among players. The players of this games worked together to find clues, understand their meaning and then discuss it. One week you could be the first to find and decipher a clue and share it with others, the next week you perhaps got clues from other players. So, how can we put all this cool stuff into practice? Well, first of we could and perhaps should encourage students more to look beyond the typical LMS. Of course it’s great to have all the course materials and assignments in one place, but students should be encouraged to look for other sources of information and other tools. The course material should be written in a more interesting way, it should challenge students to verify information, to look for alternative explanations. And course activities should encourage students to use different tools and skills. The LMS should perhaps mainly be a centralized place to share learning experiences, discuss new findings, argue about important questions etc. I really think that we can learn a lot from the observation of things that manage to intrigue people. And I believe that learning and education should be intriguing for students. Now we have lots of tools that can help us to make that happen; the only limit is our own imagination and creativity. And I think the best way to get new ideas is to find forms of learning that people start on their own and that they find fun and rewarding. I think that instead of asking ourselves How can we teach this? we should be asking the question How can we make the learners want to learn this?